On a frozen January night, a young man hangs himself in a lonely corner of the Upper Peninsula, in a place they call Misery Bay. Alex McKnight does not know this young man, and he won't even hear about the suicide until two months later, when the last person Alex would ever expect comes to him for help. What seems like a simple quest to find a few answers will turn into a nightmare of sudden violence and bloody revenge, and a race against time to catch a ruthless and methodical killer. McKnight knows all about evil. Mobsters, drug dealers, hit men—he's seen them all, and they've taken away almost everything he's ever loved. But none of them could have ever prepared him for the darkness he's about to face. 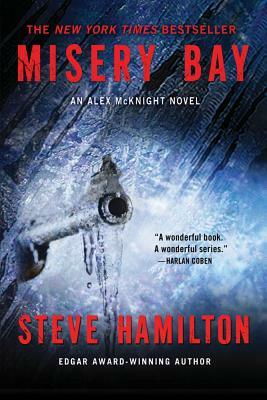 A New York Times bestseller, Michigan Notable Book, and Boston Globe Best Crime Book of the Year, Steve Hamilton's Misery Bay marks the return of one of crime fiction's most critically acclaimed series.